Since 2006, the Department of Transportation, Taipei City Government has integrated the traffic information provided by its subordinate offices, including Taipei City Traffic Engineering Office, Taipei City Parking Management and Development Office, and Taipei City Public Transportation to establish a service and information integration network platform—Taipei City ATIS Web (http://its.taipei.gov.tw), which provides integrated dynamic transportation information to the public. 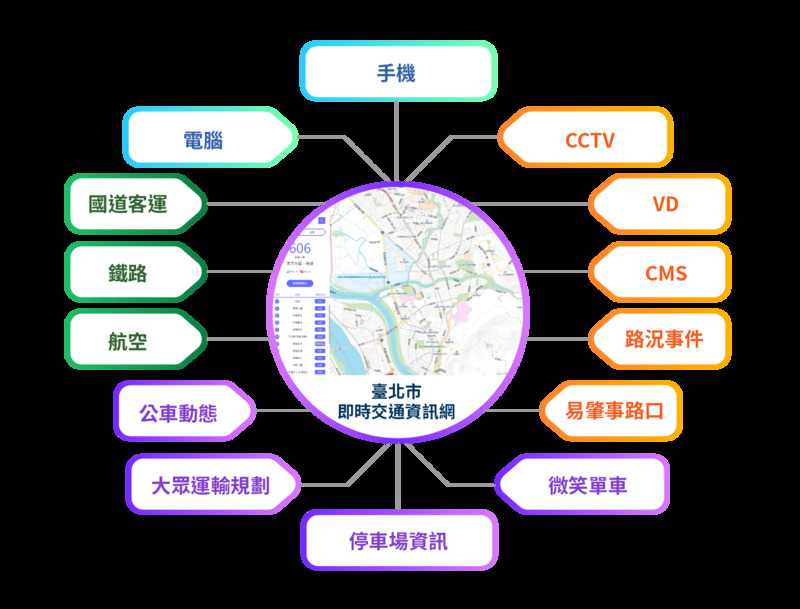 The public can use the Taipei City ATIS Web with their computers, through the information of bus stop signs, bus routes, Taipei Metro stations, and intersections to check public bus real-time operations. Drivers can also use the “shortest route”, “fast road priority”, or “accident/event and traffic-control road section avoidance” navigation functions, reducing time on the road, and can use real-time images/doc and real-time information on traffic conditions to determine driving speed, flow smoothness, etc. The service also enables drivers to confirm the number of spaces available at parking facilities, note accident-prone intersections, and where there is road construction. In addition, the “Inter City Information” function enables users to use different modes of transport, such as high-speed rail, regular rail, aircraft, ship, and intercity bus to plan travel between cities.